Obnoxious. That’s it, that’s all they are - obnoxious. I’m referring to labels, of course. Whether self-proclaimed or placed upon us by others, labels are pesky, limiting, little buggers. I do see the need for us humans to make sense of this wild, anarchic world we live in through categorization; it’s what our overgrown primate brains do best. We draw upon cultural, biological, and personal history to make sense of the veritable deluge of information we encounter each day or, at least, we try. This is one of our species’ most precious and dangerous abilities - that we place things in boxes. It’s how we recognize complex emotions, remember walking paths, and learn how to speak, but there are certain realms where this incredible aptitude for categorization must be held in check. Let us agree for a moment, that for the sake of the planet, it is ideal to do what each of us can to reduce our ecological footprints to the best of our ability. Say, for example, you choose to give up driving. You could then call yourself fossil-free, right? Maybe. Okay, now let’s say you stop using straws to sip your Friday evenin’ Moscow Mule. You could then say you’re straw-free. Okay, now let’s say you refrain from eating meat. You’re now, conceivably vegetarian or meat-free, right? But why label yourself these things? What utility does one realize by doing so? Let me explain. Have you ever tried to start a seven-day-a-week workout regimen from complete scratch, then you miss one day and the whole thing comes crashing down? You missed Tuesday’s workout, so you’re off the wagon and the entire daily exercise commitment goes out the window, and now you’re munching flamin’ hot lime Cheetos and Netflixing your self-loathing away. The point here is that for us to make changes, we have to take things in strides. Realistic strides towards an attainable goal. So, why call ourselves vegetarian/vegan, plastic-free, or any other binarism when it promises nothing but a hard ‘yes’ or ‘no’. We’re striving to better ourselves and the planet, not adhere to a label of failure or success. We progress toward something bigger than labels. It may be useful to set personal, internal objectives of never eating meat again or never taking a straw again, but those should be just that - personal. Let’s instead say we’re trying to use fewer straws. We’re attempting to reduce our meat consumption. This way we’re not either on the wagon or off the wagon, and therefore worthless if off and almighty if on. 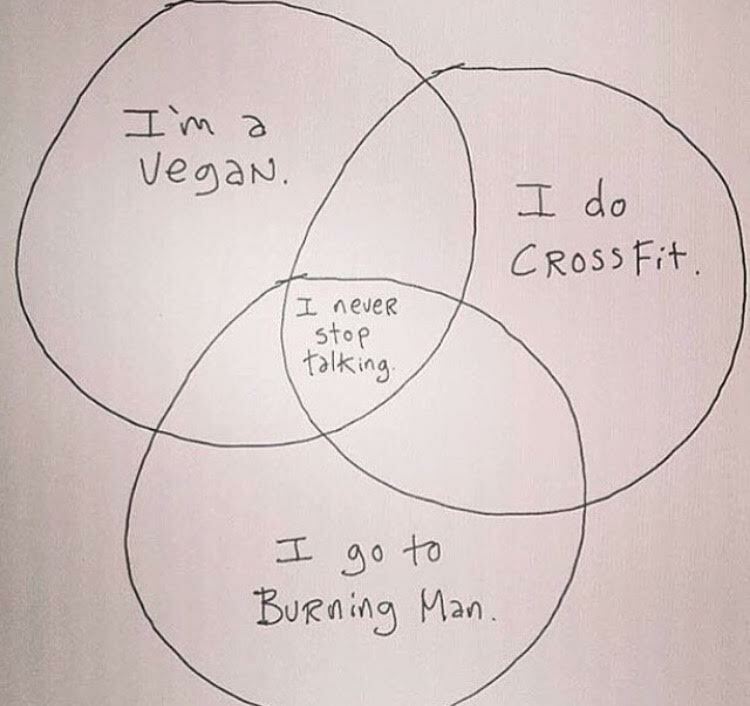 Most importantly, if we’re able to do away with vegan, non-vegan binarism, we might once and for all silence those yahoos who think it ever so important to incessantly disclose their chosen badges. Let’s be clear here. Brett could have the butter, but chooses not to. Good for Brett, but still, Brett should shut his yapper. All Brett achieves in his ever so gallant declaration of foregoing animal products, is indicating to his peers that he is insecure. I know, a bit harsh... but it’s true. So, let’s all take a minute to remember whether we’re driving our Prius’s, doing yoga, crushin’ CrossFit, or abstaining from gluten and dairy-- let’s just do those things. No need to tell the world. After all, the saying is, “Be the change you wish to see,” not “Tell everybody about the change you wish to see”. In other words, Cram it Brett - nobody cares.